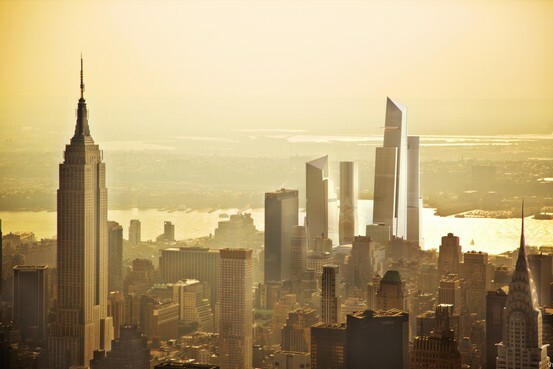 Renderings of Hudson Yards, on a hazy day. It’s been a while since our last Hudson Yards update. Two and a half years ago, amidst a slow economy, Related Companies hammered out a deal for the Hudson Yards space with some string attached, and in May of 2010, they and the MTA signed the contract. With closing dependent upon some various economic benchmarks, it seemed that construction at the site would be slow to move forward. Commercial construction has been slowed by a lack of financing but that market gradually is returning. McGraw-Hill Construction, which analyzes construction data, estimates that building will commence on 272 million square feet of office, retail, hotel and warehouse space in the U.S. this year, more than in any year since 2008. Still, new construction remains slow by historic standards and tends to be limited to a few major cities…Related is trying to finalize deals with its partners by year-end. The talks are far enough advanced, according to Related and others involved in the project, that the company feels comfortable starting on the first building, which it hopes to finish by 2015. For future phases, the costs grow and the schedule may again be thrown off by the economy. Related needs to build an $800 million platform over half the rail yards for the second phase, and another platform for the third phase. Related would start the second phase if it secures a large tenant. Meanwhile, a small item in today’s Post drew a raised eyebrow. Steve Cuozzo reported that Related has asked the MTA to revise its deal. Cuozzo’s report is short on details, but apparently, Joe Lhota had this to say: “Related has approached the MTA to amend the existing deal. I am willing to entertain it so long as the MTA’s interests are fully protected.” Related denied the report, but where’s there smoke, there’s often fire. The MTA Board voted yesterday to approve yet another iteration of a contract with Related Companies for the rights to develop the Hudson Yards area. If all goes according to plan, this deal will eventually net $1 billion for the MTA, but as work continues apace along the 7 line extension, the money from Related is no sure thing. In fact, the contract contains terms and conditions that may eventually allow the real estate developer to back out entirely. Midtown office space availability rates hit 11 percent, according to brokerage CB Richard Ellis. While the current rate is at 14.8 percent as of March, 11 percent is relatively achievable, as according to CBRE numbers, midtown averaged well below 11 percent between 2005 and 2007. Manhattan co-op and condo sales price achieve an average $1,200 a square foot for a sustained period (it’s slightly more nuanced than this). The fourth quarter of 2009 saw an average price of $1,051, according to Miller Samuel. The rate has cracked $1,200 a foot in three separate quarters in the last cycle, hitting a peak $1,322 a foot in the second quarter of 2008. The architectural billings index must pass 50 for the commercial sector. It’s currently at a bit below 45, and was last over 50 in early 2008. On the one hand, these conditions appear to be reasonable demands for a deal of this magnitude. After all, Related shouldn’t just fork over $1 billion if it doesn’t feel as though it can fill the office space. The developers appear to want tenant guarantees before closing as well, and that’s no sure thing considering the costs, location and amount of time it will take to construct the support platform over the rail yards and the buildings in the complex. On the other hand, this deal jeopardizes the MTA’s position. Related could back out without payments or the company could opt to wait years before sending the MTA any money. Meanwhile, the work on the 7 line will continue, and it seems quite likely that the one stop at 34th St. and 11th Ave. will open years before the majority of the Hudson Yards development is even under construction. The stop at 41st and 10th Ave. then should become more of a priority because it will make this project more worthwhile in the short term. It makes development sense to build out to areas underserved by transit that are ripe for growth. But it makes even more sense to spend dollars that aren’t unlimited on improving transit options in heavily-congested areas of the city. The wisdom of this project continues to remain tenuous at best. With the city and the MTA at an impasse over the fate of the 7 line station at 41st St. and 10th Ave., real estate lobbyists and politicians are making a last-ditch effort to secure a federal grant for the badly-needed station. As Michael Howard Saul of The Wall Street Journal detailed today, officials from the Real Estate Board of New York and City Council Speaker Christine Quinn are going to meet with Vice President Joe Biden in the hopes of convincing the rail-friendly veep to find some of the $500 million the city needs to build this station. Mr. Spinola said a report commissioned by the board suggests supporters have roughly a year to secure funding before it’s too late. But the city believes the time frame is closer to two weeks. If federal funds can be secured, Mr. Spinola said, officials in the Bloomberg administration told him there’s a “strong desire to find another $250 million” in city funds. Somehow, someway, the $250 million should materialize. In the grand scheme of development in New York City, that’s not a significant amount of money, and both the MTA and the city are making an expensive and nearly uncorrectable mistake by not building this station at 41st St. and 10th Ave. Hopefully, smarter heads will prevail. I also want to note that REBNY has dropped the ball on this one. The city killed the station in August of 2008, and the powerful real estate board sat on its hands for nearly 18 months. Now, time is of the essence, and it’s unclear if the money will come through. Had the lobbying begun when the station was shelved, the funding would have been easier to secure and could have been in place already. After signing the contract, Related will still have to post another $21.7 million in the following 12 months. But the new plan allows the developer to post a promissory note in lieu of cash. The MTA praised the restructured deal because it maintains the price tag negotiated during better times. Yet, I still fear that Related isn’t actually going to build much for a while. The area will benefit from the station at 34th St. and 11th Ave. eventually, and the city should be encouraged to build out transit to underserved areas. But for now, this is still a very expensive project at a time when funds are tight, and the fate of the station that could have an immediate impact on the surrounding area is very much in doubt. Still, misguided subway expansion is better than none at all, and one day, the MTA will get its $1 billion. While officials know it will take decades for Related to develop the area, for the MTA, the concerns here are in the dollars. Initially, Related was to start making installments of the $1 billion it will owe the MTA over the next century last year, but as Brown reports, “now the firm will not have to close on the deal until the economy hits certain specific benchmarks, showing improvements in such areas as vacancy rates.” At some point soon, Related will pay the MTA $43.5 million as an initial payment, and the real estate company has invested heavily in the site already. But the longer these negotiations drag on, the more the value of missed payments to MTA just grows and grows. The Hudson Yards project is quickly turning into a giant bust. While city officials are still optimistic that something will happen there, Deputy Mayor Robert Lieber said earlier this week that it will take decades to complete it. Meanwhile, Lieber also stressed the importance of the city-funded 7 line extension to the success of the project. With this admission of an ambiguous start or end date for the project, I still this is as nothing more than a subway to nowhere. The MTA claims the project will be completed by 2013, and there’s a good chance nothing will be at the Hudson Yards site by then. Meanwhile, the state and transit agency are still embroiled in a dispute over the cost overruns that have, for now, shelved the proposed station at 41st St. and 10th Ave. Right now, the city then is paying over $2 billion for a train that doesn’t go anywhere and may not even serve a real development for decades. That’s just a terrible allocation of money and resources. The MTA and real estate developer Related Companies were supposed to close their $1 billion deal for the Hudson Yards land this weekend, but with the economy in the tank, the two sides agreed to delay the closing by a year. While the MTA really needs the money, the authority, according to Charles V. Bagli of The Times, understands that in today’s economy, replacing Related would be nigh impossible. According to Bagli’s sources, Related will pay $10 million for the delay, and the closing is now expected by Jan. 31, 2010. The Hudson Yards area, it seems, is doomed, and the MTA may suffer a financial hit because of this curse. Last May, after months of public and private wrangling, the MTA saw its first $1-billion bidder pull out of the Hudson Yards project. Shortly after that Tishman Speyer deal for the rail yards died a painful death, Related Companies swooped in and signed a similar deal. The Related deal, it seems, may join the Tishman plan in the great Hudson Yards in the sky. If the Metropolitan Transportation Authority and the Related Cos. cannot reach a deal on Hudson Yards in 10 days, the $15 billion project could end up being postponed indefinitely or never being built. The authority and the developer have until Jan. 31 to sign a contract, which would trigger a schedule of payments that could ultimately bring close to $1 billion into MTA coffers. But the sinking economy and a paucity of financing are pressuring both sides. Given the uncertain market, Related would like to avoid commitments of scope and schedule that threaten the profitability of the project. At the same time, the developer wants to move forward and not forsake the $11 million deposit it put down last May. But with MTA CEO and Executive Director Elliot Sander calling the negotiations “very sensitive,” it’s easy to see a collapse in the near future. With this deal on the rocks — and the Atlantic Yards deal treading water for another year — the MTA’s capital budget may suffer. These mega-projects were to bring in over $1 billion, and if they both fall through, the MTA will have to scramble to replace the funds. Meanwhile, as the Related deal teeters on the brink, the city’s commitment to the 7 line extension remains in place. No matter what happens, the city will fund the construction of the 7 line from its current Times Square terminus to 34th and 11th Ave. While there may be no development on the Hudson Yards area for a decade, at least the subway will serve the area. With more pressing projects on tap, that hardly seems like a good use of funds to me. This could turn into quite the boondoggle. For the Metropolitan Transportation Authority, the sale of the Hudson Yards space basically represents free money. All they have to do is sign the contract for the rights to develop the 26 acres on the far West Side above the train tracks, and $1 billion will be theirs. The deal to put $15 billion in residential and commercial development atop the M.T.A.’s West Side rail yards has hit a delay, as the agency will not sign a contract with developer Related Companies this week, as was originally scheduled. The state authority says it has reached an agreement with Related (which is in a joint venture with Goldman Sachs) to push back the deadline for signing a contract for the property by another 90 days, as the M.T.A. has been slower than expected in producing the needed paperwork. “We have together agreed on an extension of the designation period,” said Gary Dellaverson, the CFO of the M.T.A. (who has to have one of the least enviable jobs in government these days). “Our expectation was that the documents would have been turned a month and a half ago. Now, this confidence is all well and good, but this news — coupled with yesterday’s examination into Dellaverson’s risky investment strategy — makes for a rough week for the MTA’s CFO. It’s not a good time to be in charge of money, but so far this week, as the MTA heads into an emergency budget meeting next week, we’ve learned that Dellaverson OK’d some risky investment strategies and hasn’t yet seen fit to push forward on a $1 billion windfall deal for the MTA. What other motivation could the MTA’s money man need? Update 2:55 p.m.: For the official MTA statement, head on over to this press release. It has more details that you could ever want.